From our Clients and Friends! Hi Sharon! Just wanted you guys to know we got our first utility bill with a full month under our solar power – our bill from Talquin was $12.00!! How wonderful is that? We’re thrilled. Thanks for the support. I love my solar system. Without running into you at the Tesla supercharger, I would have never pulled the trigger. I enjoy it in ways that don’t make sense to most people. I’m out walking Coco, sunshine in my eyes, enjoying the thought of making free power. I spent the morning researching Power Factor, I still don’t think I understand. Have a great day. 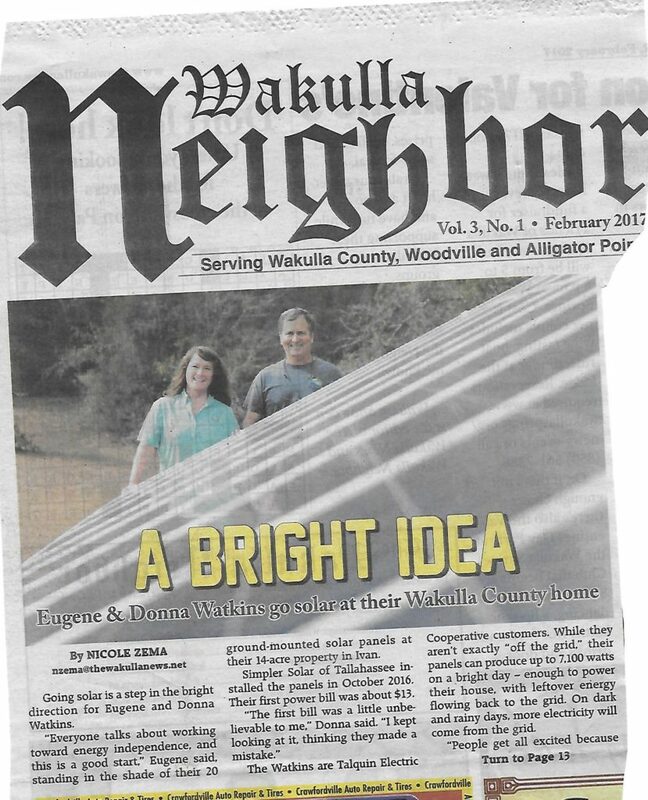 Click here for Article on Defuniak Springs Solar Home! We just got our first Electric Bill from Gulf Power since we have been 100% compliant. We apparently used 81.11 worth of power, but our panels produced that amount or more, so we owe $00.00 for electricity. That’s the good news. The bad news is that we (and supposedly all their customers) pay a $22.35 monthly administrative fee, whether you use their electricity or not. (Clerical, billing, customer service, etc.). Anyway, I’m still putting this in the win column. I may be stuck with paying their admin. Fee, but so far, the electricity is free. As a rebel & non-conformist, that puts a smile on my face. I would like to take the time to thank you, Al, and the crew who came to our home to assist us with this problem. The response we got from the office was exactly what I expected and the crew, Tony and the others were very professional and thorough in the repair and replacement work that they did for us. We are extremely pleased and grateful. Thanks, Will, for your inquiry. 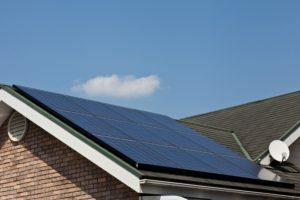 I am very pleased with the PV panels that Simpler Solar installed on my home last October, on the good advice of my FSU colleague Munir Humayun. I strongly recommend that you ask them to install them on your home in Apalachicola. The cost to you is now a real bargain and will be offset by an increase in market value of your home. And your example will encourage others to rely more on renewable sources of energy, especially solar in our sunshine state. The time is fast approaching when most people will come to realize that reliance mainly on fossil fuels must soon end. Moreover, investing in today’s PV technology will promote advances in new technologies of tomorrow. Please keep me posted on your experience and that of others in Apalachicola. I have had a 8.3 kW solar PV system installed since 2011 (by Simpler Solar) and have been very happy with it. The system produces more power than we consume so in retrospect I should have put in a smaller system. The size was something I determined but then increased another 10% for aesthetic reasons to have 36 panels in 3 strings of 12 each instead of 33 panels (3 strings of 11 each). Because of this I have not paid more than $8.93 per month in electricity, a flat rate for the rent of the net meter. Simpler did a great job on the installation. The only maintenance required is an annual cleaning of the panels to remove the pollen build up this time of the year. You can do it yourself or have someone come out to do it. The loss in efficiency is fairly small. The installed price has come down dramatically. I paid $36K for an 8 kW system in 2011, but Jack paid about $12K for a 4kW system last year. There is a 30% federal tax incentive, and there might be local incentives. This is Marvin down here in Flagler County; South of Bunnell. I am an old Cowboy, been getting the solar pump going for several months. Just want you to know everything you sent me last works perfect! Beautiful! I got her going last Friday and came back and did a little finishing up today. It’s 100% absolute solid. Plenty of water, plenty of power to keep my batteries charged. I hooked them up double just like you said. Very happy customer, just wanted to brag on you and your knowledge and tell you thank you.